Although the shoulder is one of the body's most versatile and mobile joints, it also can be prone to injury. A shoulder dislocation occurs when the arm bone pops out of the shoulder socket. Often the result of a strong blow or extreme rotation, a shoulder dislocation causes a visible deformity, immediate swelling, intense pain and loss of movement in the joint. Knowing how to care for a dislocated shoulder can help you in recovery. Seek medical attention immediately after your shoulder dislocates. Keep your injured arm supported with either a sling or the opposite arm until you reach your doctor or the emergency room. Wear a shoulder immobilizer for at least two to three weeks, unless directed otherwise by your physician. This special type of arm sling immobilizes your shoulder joint and keeps your arm close to your body. Follow your doctor's instructions exactly. In most cases, this involves wearing the shoulder immobilizer all day, every day. Take any medications prescribed by your physician. Typically, most doctors will prescribe an anti-inflammatory medicine after a shoulder dislocation. If the shoulder is particularly tender, he might also prescribe a medication for pain. Ice your injured shoulder for 20 to 30 minutes every three to four hours during the two weeks following the dislocation. If you do not have a cold pack available to use, a bag of frozen vegetables will do the job. Cold therapy helps to prevent swelling and relieve pain in the area. 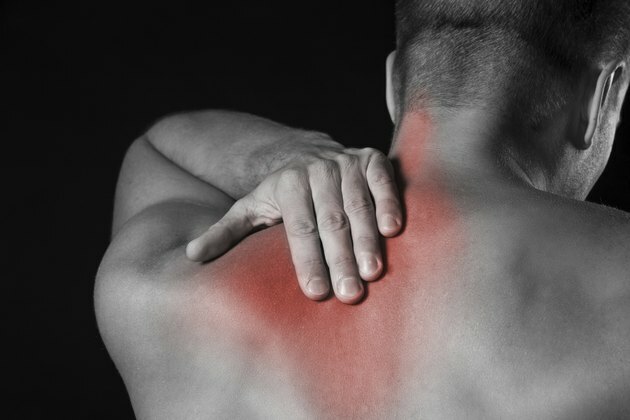 Sleep in a position that allows you to protect your injured shoulder. If necessary, use pillows to block your body from rolling onto the dislocated shoulder. It may be necessary to sleep in a slightly propped-up position until the arm sling is removed. Follow your rehabilitation program exactly as recommended by your physician or physical therapist. The program will likely involve gentle exercises to stretch the shoulder and maintain mobility of the joint. Your therapist will determine appropriate activities for your specific condition, and it is vital that you follow the guidelines exactly. If your shoulder dislocates regularly, your doctor might show you how to properly relocate your shoulder. However, you should still seek medical attention as quickly as possible to ensure correct placement. Do not try to pop a dislocated bone back into place on your own, as this can result in permanent damage to your shoulder joint. Avoid strenuous activity for at least four weeks following the dislocation. During the recovery and rehabilitation period, your shoulder is at an increased risk for another dislocation. Prevent a second injury by avoiding strenuous shoulder movements in the injured arm. Activities to avoid include push-ups, boxing, tennis, dancing and golf. Before returning to your previous level of activity, consult your physician or physical therapist.